Fiber cement is available in many different styles, including shakes. Fiber cement mimics the look of wood. Fiber cement is made up of 90% sand and cement which is practically fire-proof. 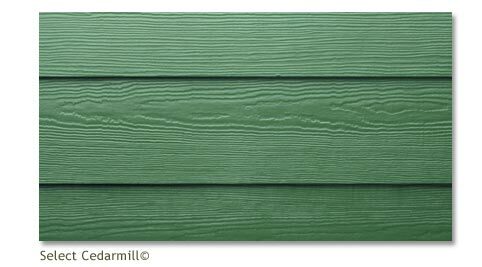 Hardie Plank Siding is warrented for 50 years! Installation takes longer than vinyl and it's recommended to be done by a professional. NOTE: If not cut properly, product can leave harmfull dust on your property. We only use dust-free OSHA compliant cutting methods to protect you and ourselves. Available pre-painted from the factory or can be painted on site. It's reccommeded to re-paint every 15-20 years. Fiber cement is more expensive than vinyl, on average about 40% more for combined labor and material, however, we feel the pros out way the cons. It can be very cost competive to some of the premium vinyl products on the market. PLEASE VISIT OUR PHOTO GALLERY TO SEE SOME OF OUR WORK WITH FIBER CEMENT.